Walled Gardens originate from the Monastic enclosed courtyards and Cloister gardens of the Middle Ages. Monks were educated and studied Latin and botany, growing herbs and flowers for medicinal and culinary purposes. Evolving over the centuries, the formal Knot gardens and geometrically laid decorative Parterres helped create the evolving productive Walled Kitchen Gardens so essential to Mansion and Palace estates. As botany was increasingly studied and plant hunting and discovery brought more plants from foreign lands into the country, there was a need to grow and nurture these exotics. Typically, the Walled Kitchen Garden would consist of one third protected growing, namely glasshouses, including Melon Pits, Pinery, Vinery, covered frames and cucumber houses. With the advent of the 18th Century Landscaped Park designed estates, the Walled Garden grew in importance. They vary in size from 0.4 hectares to 12 hectares, often staffed by a minimum of three men and sometimes upwards of 30. Starting out close to or beside the Mansion and primarily for decorative purposes they soon evolved into fully working gardens producing fruit, vegetables, herbs and flowers for the families and sometimes the estate staff. The new exotics needed specialist treatments and heated glasshouses, pits and frames to grow and the newly introduced pineapple was to become a status symbol. Many a mansion gate pier has been decorated with Pineapple finials as a sign of the owner’s wealth! The larger your team of gardeners the more respect and status you gained. Walled Kitchen Gardens were often increasingly sited some distance away from the Manor House as they were considered rather dirty and smelly working places. The engine room of the Walled Garden was the composting area and the Back Sheds and Gardener’s Bothy. Sadly, very few estates still retain their remaining Back Sheds. William Coy’s Stubbers Gardens in South Ockendon originally had 7 walled gardens and certainly still had remaining Back Sheds when I visited in 2012. John Heaton’s Georgian Bedfords Park Mansion estate had a Walled Kitchen Garden, and according to Neale’s Seats of Noblemen and Gentlemen in 1818, had a ‘Pinery of some extent’. There was a range of Back Sheds and a gardener’s Bothy, nearby water reservoir and within the garden’s 4m walls, 2 working wells, Melon pit, Pinery and Cucumber House, often later referred to as a Fernery, as that was how it may have been used in the later Victorian heyday of fashionable Fern Collecting. The high walls surrounded by a belt of tall trees shelters the garden from strong winds creating a microclimate and along with a double flued South facing North Wall heated by wood and later coal, provided the perfect place to grow sufficient produce for 12 people for a year, all year round. Heated glasshouses and new methods of growing with decomposing manure providing heat and moisture for exotics and extended the growing season. Gardeners worked 365 days a year, day and night in winter keeping the fires going. 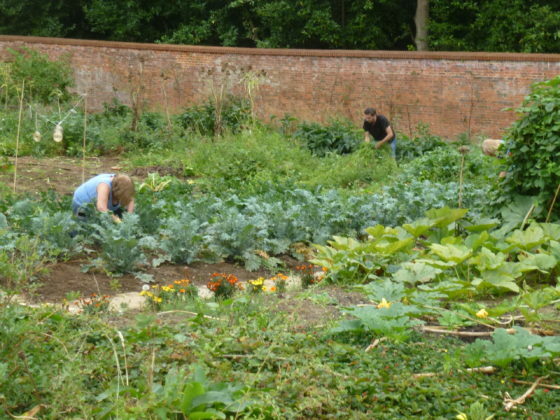 Bedfords Park Walled Kitchen Garden is still growing and nurturing plants over 230 years later, in a Community Food Growing Project. New life is being breathed into this amazing space which had laid derelict from 1999-2011. Radial and axial paths are to be restored along with the original quartered design. I am sure that John Heaton, once financial adviser to the Dukes of Portland and the 5th and 6th Dukes of Devonshire, would be justly proud that we are caring for what remains of his Walled Kitchen Garden, and the amazing features of his wonderful Parkland estate.